1873 1895 G.W.Turner & Sons In 1873 Tomkinson retired and the business was continued by George Turner - they also owned the Alexandra Works at Tunstall. ?? ?? 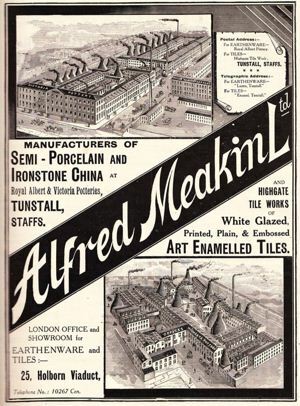 Alfred Meakin Alfred Meakin (Ltd.) occupied the Royal Albert, Victoria and Highgate Potteries, in Tunstall.